I am on a mission to improve my mailing list – starting with the copy of the main subscription form and now, moving on to the actual emails send to potential new subscribers. I am using Mailchimp as my email service – but any of the main service providers out there have the same exact options to configure the signup flow. In this article, I’m going to be looking at the Confirmation Email specifically. This is the email that a potential subscriber will get when they first put their email into my signup form and hit “Subscribe”. By default, this email is already configured with some generic copy – and Mailchimp does a decent job of it – but this is the first email your potential subscribe gets from you – generic copy is not going to cut it. So what’s wrong with this email? First – it doesn’t really say anything. This is a chance to impress upon the user why in the world they would like to subscribe to my mailing list – what’s in it for them. 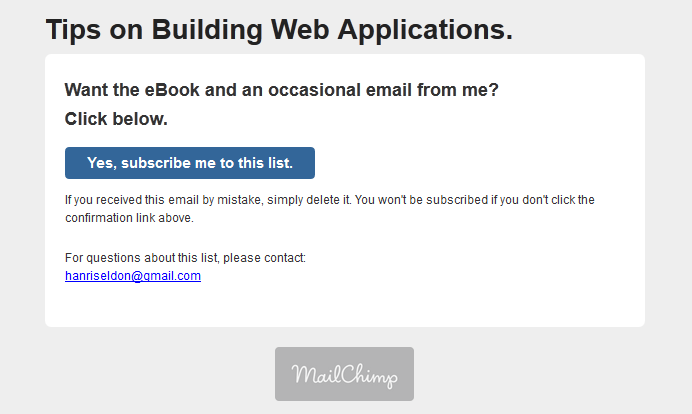 Instead all a user can get from this email is what they already know – a moment ago they wanted to subscribe. So let’s break the email down into parts and see how we can carefully craft and improve each of these parts. Please confirm that you want that free eBook and other emails from me. First – this is consistent with my main signup copy – where I specifically the reader than – if they trust me enough to give me their email address, I will give them a free eBook. So why not remind them of that: Remember that book I mentioned – you’re going to get access to it just as soon as you confirm. Next – it sets clear expectations – always a good idea – it tells the reader that they are indeed going to receive other emails from me. And finally – I like being personal – so this is just a bit more personal than the original “Please Confirm Subscription” bit. On to the title – right now, it simply says: “The Baeldung Posts“. Why? Because that’s what I originally named my email list – not knowing that this name is going to end up in the first email I send to subscribers. Tips on Building Web Applications. Nice and simple – and exactly what they’re going to get from my blog – articles about building Web Applications – not Posts. Again – this is a lost opportunity. The reader already knows this is a subscription confirmation email – they know how this work, as it’s highly unlikely that this is the first one they see. Want the eBook and an occasional email from me? And we are done – the email is short and to the point, and hopefully the user will actually read it now, instead of just glossing over it. If it’s some generic copy that has nothing to do with why they’re actually signing up – then they simply wont. On the other hand, if it’s clear what the win is for them – if one quick action can lead them to immediate gratification – then maybe they will and you will have gained a new subscriber. How did you edit the title? 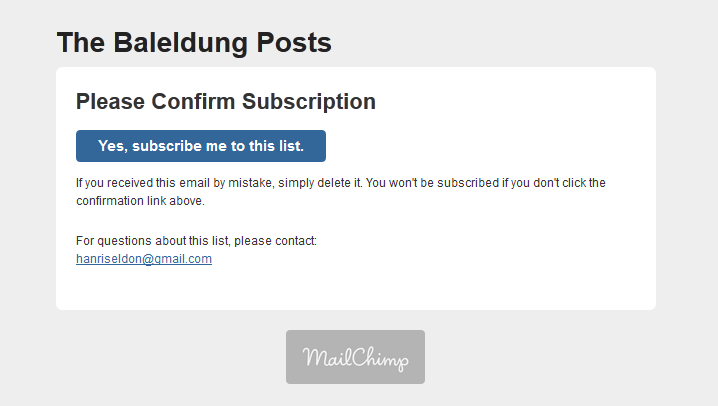 I figured it out, I’m using Mailchimp. Do you like Aweber better and if so why? BTW this was a great little article, I found it so useful. For the sake of everything that is holy: next time you figure something out, post your solution to the problem. People stumble upon this using Google and are left to figuring it out themselves. There is a link to the signup form editor. That should do it.